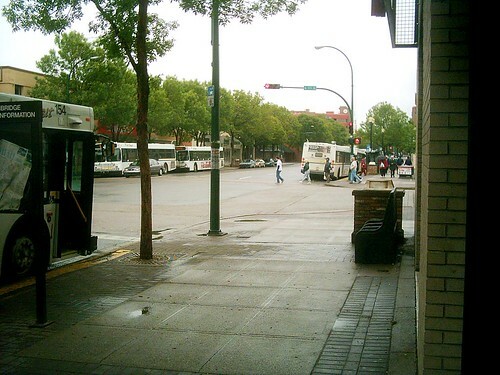 Photo of Downtown Lethbridge by Kim Siever. At the beginning of the month, I stumbled into a conversation on Twitter with other people from Lethbridge (Alberta, Canada). We were discussing the need for more services on our side of the city. Without getting into too much detail, my side of town (West) is heavily populated, but served by comparatively few businesses. Its population has grown dramatically since I was a kid. For whatever reason (I’m sure smarter people know why) businesses have either shied away or failed to stay in the area. As far as I know, the municipal government has not been very active in encouraging or promoting such growth (once again, smarter people are free to correct me here). On the other hand, the downtown area has seen a great deal of time and money invested in its revitalization. During that Twitter discussion, this point was brought up. It’s been 3 weeks since that conversation, and it’s still on my mind. Are “downtowns” still relevant? Do they still define a city the way they did in generations past? Certainly, from a tourist standpoint, I’m sure that’s the case. People visiting New York don’t wander through residential areas to sightsee. But what about the residents? Do you think it’s important for your city to have a large central business core, or would you prefer the convenience of smaller centres spread throughout the city? Are there economic reasons why a “downtown” area is better for a city? Perhaps I’m the last person to ask. I work from home. I do most of my shopping on my side of town. If I have to buy something I can’t get here, I don’t go downtown to find it. Occasionally I have to meet with a client or make a deposit downtown. Otherwise, I do my best to avoid it. There’s nothing wrong with the area. I worked there for a long time, and there are plenty of great shops to visit. I just don’t like hunting for parking, plugging a meter, and then dealing with the crowds. Obviously, if I lived close by, that would be a different story. In addition, I just don’t see the benefit of spending money in order to build a city’s “character”. I always felt that character developed over time on its own. It doesn’t seem like the type of thing you plan for. When there are so many more important problems that need our time and money, I just don’t see “character” at the top of my spending list. Maybe when I can take my sick child to the emergency room without having to pack 2 meals and an overnight bag, I will see things differently. Yet again, maybe it’s up to us entrepreneurs to do something about it, instead of relying on City Hall. I highly doubt I’m the norm, so I would love to hear your opinions. Whether you live in Lethbridge or a city of 2,000,000 across the globe, I would like to know what you think about the idea of a “downtown”. Is it a priority to you? Should it be for your municipal government? Let me know in the comments. I ran into something today, and I wanted to write a quick post about it, at least as it relates to small business. Each and every one of your employees is a part of your marketing. What do I mean by that? I mean that any actions of even the most casual of back room staff adds to or takes away from the image your company has in the public eye. My experience today has nothing to do with business, per se. It was more of a “spiritual employee” that I ran into that really put me off. It would be downright crazy of me to start talking religion here, so I won’t. However, to frame my objection, I would consider myself to be part of the same basic religious background as this “employee”, so I’m not coming at this experience with a pre-defined bias of any type. I know that there is a strong temptation to place less emphasis on hiring low level employees in your store. I’m sure it’s an even stronger urge when you’re gathering volunteers. Maybe it’s the delivery driver, or the young kid stocking shelves in the back. You just need someone to fill the position, and you don’t really care how qualified they are, as long as they get the job done, and don’t ask for a lot of money. Please resist this urge at all costs! Every single person that works for you represents you. If your driver shows up to someone’s house and every 4th word out of his mouth is a curse, that makes YOU look crude. If your waitress is texting her friends instead of getting your customer their food, YOU look disrespectful. See how I emphasized YOU in this. I rarely remember the name of the person that treated me poorly. If I saw them on the street, I doubt I suddenly feel the urge to yell at them. Maybe that’s just me. I will, however, always remember the store that treated me this way. And, if I happen to come across the name of the owner, I will definitely feel differently about them the next time I see them. For another example, we have 2 Wal-Marts in our city. Although they are the exact same company, the 2 stores couldn’t be any more different. One of them seems to always have friendly staff, short wait lines at the till, and well stocked shelves. The other one is usually the employee equivalent of a ghost town. We have, more than once, waited in line for over 30 minutes. Plus, they always seem to be out of the one thing I went there for. Once again, I don’t get angry with the staff. That’s about as pointless as yelling at the CSR on the phone when the phone company makes a mistake on my bill. I have just made a point of avoiding the “bad” store, and have concluded that the general manager simply isn’t as good at his/her job as the manager at the “good” store. There’s a quote that my friend and I use a lot; “everything for a reason”. By that we mean, consciously do every task in a way that you have thought through carefully, because you know it’s the BEST way to do it. Every aspect of your business is important. The logo, the uniforms, how clean the bathrooms are, and the quality of each and every one of your employees…they’re all equally important. A book I read recently talked about how the author could tell how good the business was, just by looking into the customer bathrooms. Not everyone feels that way, but if enough of your customers find that important, then so should you. So, if it takes you an extra hour, day, or week to find the right employee, regardless of the position they will be filling, take that time. Your customer’s opinion of that employee will become their opinion of you, so be aware of that. You don’t need to find “perfect” people, just someone who is friendly, hard working, and most importantly…trainable. Then, make sure someone takes that time to train them. Let them know what you expect, what you find important, and then hold them to those values. Trust me, it will be time well spent. It's been hard to drive around downtown Lethbridge for the past year or so. If you're not from around here, look at the map below. It will give you a good idea of where we’re at in relation to the US, and the rest of Canada. Just an hour North of the US/Canada border, it’s a beautiful city with a population around 85,000. So why has it been so hard? There are just too many closed and boarded up shops, especially in the heart of the downtown area. Sure, there are always businesses that come and go. You’ve got about a 50/50 chance of surviving your first 5 years of business, so some turnover is expected. That’s not what I’m talking about. It just seems like a lot of established businesses are closing their doors too. In the past couple years, we’ve lost 2 fairly big grocery stores. Ironically, the first one was located close to my house, and closed within a couple months of us moving in. The other was a few blocks from my office, and closed down last year. Gone are the days of independent bookstores (unless they’re used books). I believe there is 1 independent music store left (CD’s, vinyl, etc. not instruments). The business I worked for closed down last year after being in business for over 50 years. In the past week, I’ve heard rumours surrounding 2 more stores potentially closing down, both in the food industry. One has been around for a while, the other is fairly new. My feelings on this are not based on any statistics. I don’t know if things are any worse than they were 10 or 20 years ago. It just feels worse. Maybe it’s because I’m older now, and I look at the city in a different light. Maybe I’m a bit jaded because my paycheque was affected by one of these shutdowns. Who knows? Don’t get me wrong. If you want to open a big box store, or a smaller well-known franchise restaurant, this is a great place to be. If you feel the need to open a liquor store on a street that already has 3, chances are good that you will still get plenty of business. It’s not that the city itself is dying….far from it. There just seems to be a problem in keeping a small business alive. So, is the economy, or is it us? Are small businesses dying out at the same rate everywhere, or are we as a community just not supporting our own the way others do? This feels like a topic I need to do some more work and research on. In fact, I’m in the middle of developing another website, devoted to more local matters. This post will most likely end up there too. In the meantime, please let me know in the comments how you feel about this. Are you from Lethbridge? Do you agree with my views on the state of small business here? Is your town/city experiencing similar problems? Let me know. I think this is something we need to start talking about.